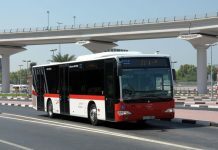 An electric powered limo super-bus is being developed for use on the journey between Dubai and Abu Dhabi reducing the 124km trip to a mere 30 minute commute. The limo bus offers comfortable and luxurious transport for up to 23 passengers. Measuring 15 metres in length, 2.5 metres wide, and 1.65 metres high and boasting eight gull wing style doors, the new super limo is hoping to offer the discerning residents of the United Arab Emirates a convenient and luxurious travel experience. 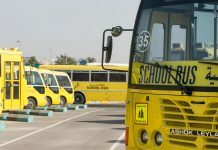 With a top speed of 250 km per hour, and with plans to create a dedicated road for the limo super-bus running parallel to the main motorway route between Dubai and Abu Dhabi, the service will reduce travel times between the two major cities dramatically which will be especially appealing to corporate clients. The Super-bus limo would not run on a regular timetable, but instead would be bookable by passengers via their mobile phone. Collection and drop-off locations can be arranged according to the clients’ needs. Another unique selling point of the limo super-bus is the green technology being used to power the vehicle. 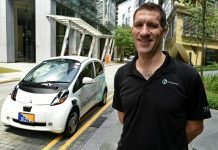 The vehicle is powered by lithium-ion battery packs which have been developed by the Delft University of Technology in the Netherlands. 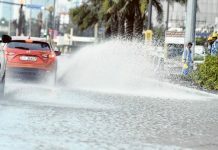 The Super-bus underwent its first road tests in Holland last autumn. 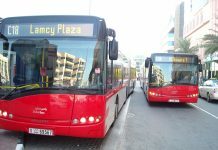 The Super-Bus will debut at the Commercial Vehicles Conference in Dubai next month. 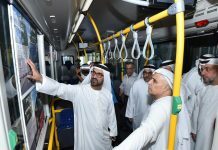 No start date for the launch of the Super-bus commuter service in the UAE has been revealed yet.